You can find paintings I currently have for sale on my PINTEREST page. I have to say that I am not the most organized person when it comes to keeping up with posting what is new but I will try. Perhaps I will start posting the most recent available paintings on this page. This is a work in progress so we shall see how things work out:) Thanks..Of course if you have any questions, please reach out to me! Summer of Love, “16 x 40 x 1.5″ (Two 16′ x 20”) Acrylic on beechwood. The paintings wrap around the sides. Dyptich! 11″ x 14″ x 1.5″ Acrylic on birch wood. Sealed with satin varnish. 16 x 20 x 1.5′ Acrylic on wood. Sealed with satin varnish. 18x6x1.5″ Acrylic on wood. Can hang or sit. 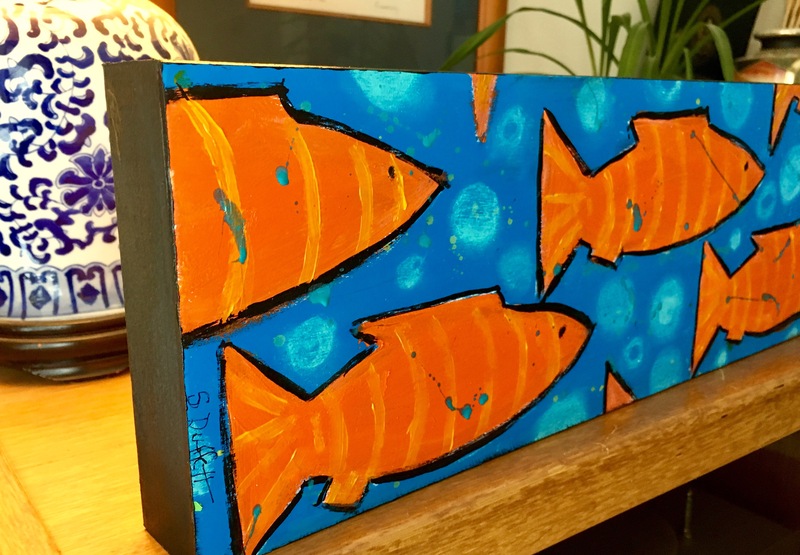 3 original 6″ x 6″ x 1.5″painted blocks. (18″ x 6″) Acrylic on birch wood. Can hang on wall or sit on surface. This beautiful ORIGINAL painting measures 18 x 24 x 1.5 inches on birch wood. Deep sides that are painted midnight blue. It has been created with acrylic paint and has been protected with a coat of matte varnish. I will ship to Canada and the United States. (Approximately $50) Elsewhere is expensive but we can discuss. If you have any questions at all please send me a message.